Getting the best from your vinyl flooring. 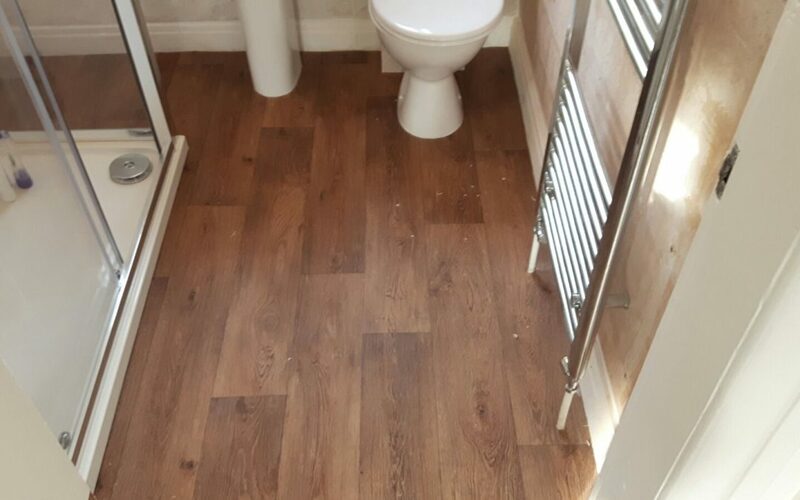 Can a vinyl floor be laid on top of floorboards in a bathroom or does it require an underlay? And if so, what kind of underlay should I use and what thickness? Well to be honest if you’re putting down a domestic vinyl, then underlay is not suitable. If somebody wearing heels was to walk over your newly laid vinyl that’s been laid on top of an underlay… Well, I’m sure you’ll be disappointed with the outcome! The pointed part of the shoe would puncture the vinyl and it would be beyond repair. 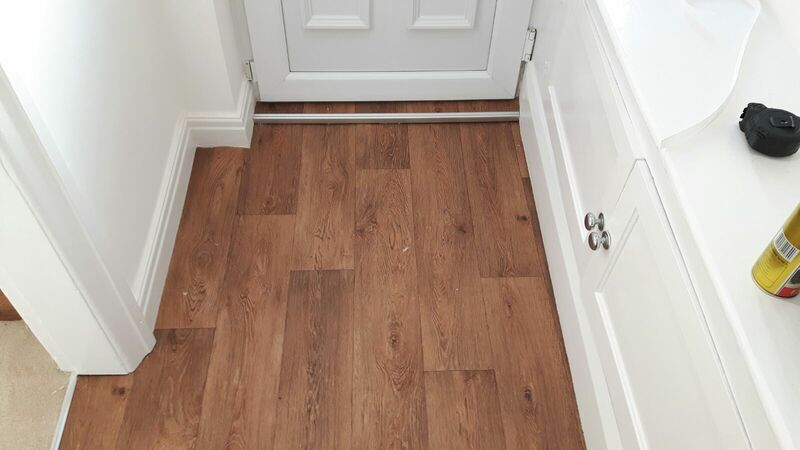 Please also be aware that uneven floorboards or any large gaps between the floorboards may also come through onto the vinyl causing tram lines or creases in the foot flow areas. What if the floorboards are not even, is an underlay still recommended or required? The best option for both of the above questions would be to have it plyboarded. We use 6 mm boards, which is the best option. This would give it the strong, stable and flat surface that’s required for a long term trouble free wear. Please see the attached pictures of a recent installation that we completed on a uneven floor. You should be able to notice that the plyboard is fixed down with nails spaced 6 inches apart , ideally they should be ring shank nails to prevent them from popping up and spoiling the vinyl. This of course is a DIY option, but if need be, please don’t hesitate to get in touch and we’ll gladly call round and give you a quotation. Is there a large range of colours and styles? The latest print technology has made it a lot easier to make vinyl floors look as real as the natural materials that inspired them and will have an incredibly natural feel you will love. That means stones look and feel like stones and woods look and feel like real woods. Ceramics, slates, mosaic, whatever your choice is we have a huge range to show you. The 3D print technology also brings amazing realism to the latest designs. Wood and stone visuals appear so true-to-life your family and friends will want to touch your floors to check if they’re real. Which rooms would recommend it for? Versatile vinyl sheet flooring is great for any room in the house. You can install it on any level of the home – above, on or below ground. It’s an especially good choice for high-traffic areas such as kitchens and playrooms or wet areas such as bathrooms and laundry rooms. But vinyl sheet is not meant for stairs, only for flat, level surfaces. Vinyl sheet is softer underfoot than other hard-surface flooring options, making it easier to stand on for long periods of time. Some offer superior scratch, scuff and stain protection and we will gladly advise you on which is best for your needs. Rest assured, we only offer vinyl flooring with a minimum rating of R10 slip resistance, this will help with stability and traction. Making it ideal for busy households with children and pets. Some manufacturers offer up to 10 years wear warranty – which is an indication of the confidence in the durability of this hard-wearing flooring. Use a simple vinegar solution for everyday washing. Vinegar is a totally harmless substance that lightly cleans vinyl floors to keep them looking fresh. As a general rule, you want to use the mild cleanser possible to do the job, since harsher cleanser are tougher on the flooring. To make a vinegar solution, simply mix a cup of apple cider vinegar with a gallon of hot water and use a mop to clean the floor. · The acid in apple cider vinegar cleans the floor gently without leaving a residue, which is perfect for keeping vinyl in good shape. As the cleanser dries, the smell of vinegar will fade away. · If you want your floor to look shiny, add a few drops of jojoba oil to the mix. That obviously depends on your budget and needs, ours start at £8.99 sq metre. Prices will vary dependant on the type of vinyl flooring you are looking for. Savings will also be made because there’s no need for costly accessories like underlay, Scotia beading, membranes and costly laminated door plates. The fitting costs are also less than ½ the price of a laminate flooring installation. If you have any questions about vinyl flooring, feel free to drop us a line – or leave us you question in the comments section below.